Posted on April 16, 2013	by Lou Murray, Ph.D.
For not having much going on in my vegetable beds, I had a pretty darn good harvest this week. Another good week for oranges! The lime harvest is trickling down finally. I froze a quart of lime juice last week, and still have more to squeeze and freeze. I put 1/4 C into each baggie. I can see some margaritas and pork pibil in my future. This is my last large harvest of oranges, although there are still a few left on the tree. I froze a half cup of orange juice with zest in a baggie, just enough to make a Moroccan orange cake. Since pork pibil also requires orange juice, I will be freezing more. It has been a good spring for citrus here at Green World. 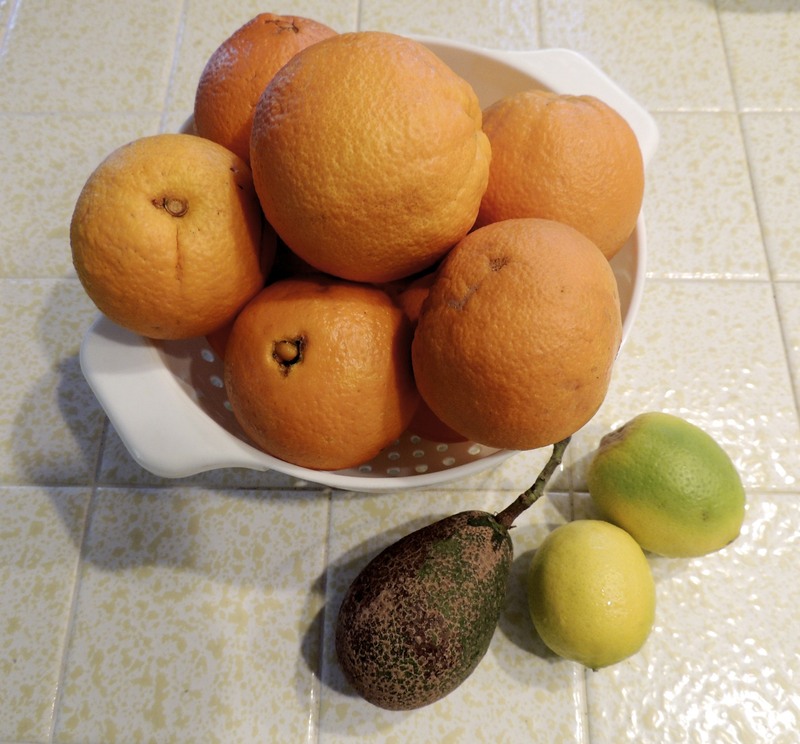 The avocado in the photo above is the last from last year’s fruit set. The tree is in bloom right now, and I should know in a few weeks whether or not there was any fruit set. Our new neighbors to the south cut down the avocado in their yard, so there may be no other tree in the area to act as a pollen donor. But I may not need it. My avocado is a Littlecado, which in theory is self fertile. We shall see. An abundance of bok choy. I planted Joi Choi variety of bok choy last year and was really happy with it. I planted it again this year and am being blessed with an abundance of this lovely vegetable. My husband is getting sick of it, so I froze this batch. All 4.5 lbs of it. I hate to tell him, but there is still more in the garden, maybe another five pounds, maybe more. It is going to seed, so its days are numbered. This is a rare visitor to our yard. 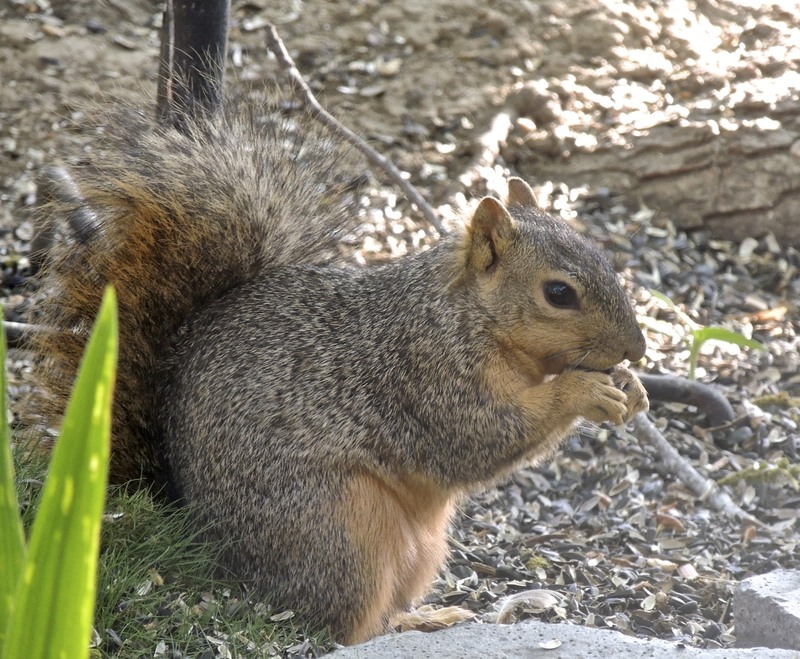 Fox squirrels are not native to southern California. They were introduced into LA in the late 1800s by some Civil War veterans, or to make those veterans happier. They have thrived in Los Angeles, and spread to Orange County not very long ago. They have established in Central Park in Huntington Beach, and we get an occasional one venturing into our yard since we live close to the park. I have heard that they can strip a tree of oranges, but so far this little guy just wants the sunflower seeds. We are far more bothered by opossums, which are also not native to this area. I am finally getting around to starting my spring planting, but I’m way behind. I planted three rows of peas and transplanted three tomato plants plus sage and basil this past week. The peas should have been planted back in January. It is actually time for a second planting, but…. Being the world’s laziest gardener, I’m only going to get one crop of peas this year. So be it. Gardening needs to be about fun. If you had a harvest, visit Daphne’s Dandelions. This entry was posted in Uncategorized and tagged avocado, bok choy, Harvest Monday, limes, oranges, vegetable garden. Bookmark the permalink. 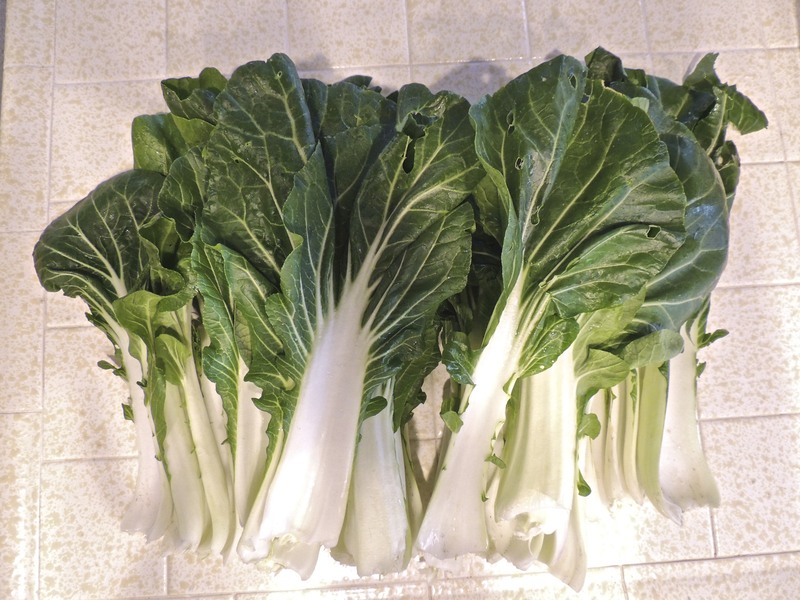 Beautiful bok choy, no holes, no blemishes. Great shot of the fox squirrel. I too am way behind with my planting, weather has not been very cooperative. Norma, thanks, but look again at that bok choy. There are plenty of holes in it. Maybe the photo doesn’t show them. I grew Joi Choi last year too. It didn’t make the garden again this year. I usually don’t have trouble with brassicas, but that one made me gassy for some reason. Too bad it was tasty. Daphne, this Joi Choi is a keeper in my garden because it is so prolific. I love it.